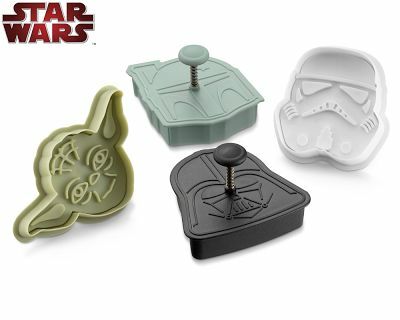 My head kind of exploded when I stumbled upon these Star Wars Cookie Cutters and Pancake Molds sold exclusively at Williams-Sonoma. I have used this style of cookie cutter by Williams-Sonoma and can tell you first hand that the detail is so awesome that you don’t need to ice your sugar cookies. They’ll look amazing naked. They look amazing iced too, but really, let’s be honest, you’ll need a BFA or pastry school degree to accomplish that artistry. Not only are these items that I know will one day be collectibles, but I predict they will sell out fast. So hoard them. First keep a set for yourself. 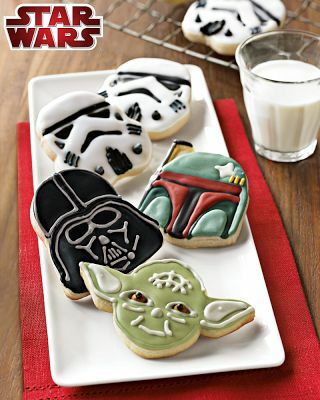 Then lovingly gift them to your favorite Star Wars fanatic host or hostess, kid and or family member at holiday time. Yes, it’s items like these that gift closets are made for. In fact, Star Wars pancakes for Father’s Day? Bliss for cool dads. We JUST bought the pancake molds yesterday! Jason makes pancakes every weekend so I’m super geeked to try them. Ha! I thought of you and Jason and the boys when when I saw them given your family’s fascination with everything SW. I realize kids will like these, but they look like a better fathers day gift then most thing I have seen on the net recently. Then again, I am a nerd and a geek. Still, what Dad wouldn’t love Star Wars pancakes? I would!! Absolutely, yay, and thank you – Father’s Day gift, signed, sealed, delivered, can stop thinking about it! Damn, that rocks. And I don’t even have boys. I love them. Wish they would ship to canada. I have the pancake moulds – they are BRUTAL for sticking!! !